Manufacturer takes products to market faster with a custom planning application that digitized a manual, excel-based process. One of the world’s largest agriculture and manufacturing companies identified an opportunity to digitize a product portfolio management workflow. To plan which products to develop and take to market, the organization needed to factor in numerous ongoing efforts and effectively coordinate delivery of power plants, cabins, in-cabin software, articulating arms, and other components. Bogging down the decision-making process was the manual, Excel-based system that company had previously employed. Each department had its own portfolio manager maintaining its own set of data, in different styles and formats. This time-consuming method prevented cross-departmental collaboration among portfolio planners, managers, and executives—not to mention lack of data integrity and history. Sensing the acute need for a software solution, one portfolio manager researched out-of-the-box portfolio management tools. Once he realized that existing products were limited to tracking IT activities or financial portfolios, he approached Devbridge. 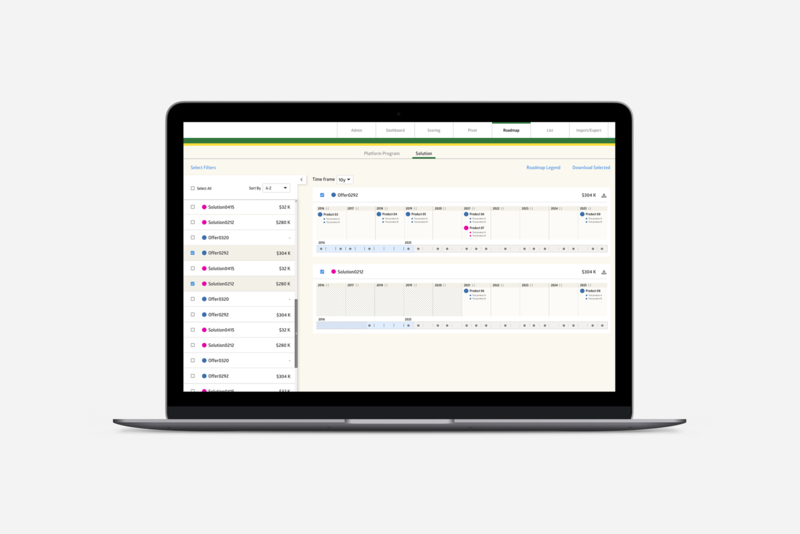 Through discussions, Devbridge helped the portfolio manager discern what his company truly needed: an enterprise-wide product portfolio planning application. Together, the team decided that the application needed to be tailored to the company’s portfolio planning workflow, with roadmap views illustrating the interconnectedness among different departments’ projects. The goal would be for stakeholders to see the pros and cons and financial ramifications of different products and feature sets. Via the agile development approach, Devbridge pinpointed lean requirements, conducted workshops, and rapidly created a Minimum Viable Product (MVP), or proof-of-concept. This Version 1—customized for the client’s needs—went live, in parallel with legacy approaches for validation. Over the next several months, Devbridge improved the application, in response to user experiences and company requests. By Version 3, the solution was released to two departments. The goal for Version 4 is a roll-out across the entire enterprise, providing global efficiencies. “Overall, creating a custom application gave the client a significant competitive advantage in the marketplace—essentially being able to more accurately schedule, plan, and ship products to market,” Schmitt said. Provided a proof-of-concept addressing portfolio planning needs of one department. Enabled data manipulation of Excel artifacts, and included a roadmap for visualizing timelines showing interdependencies of solutions, projects, platforms, and regions. Included pivot-table functionality, allowing for ad-hoc reporting across various dimensions. Added analysis and prioritization (scorecard) functions and more roadmap views from different stakeholders’ perspectives, bringing transparency and improving alignment with platforms and regions. Added parameters for project classification and prioritization and improved user experience. Added core functionality, such as scenario planning, enhanced security, and UI/UX enhancements. Incorporated changes to the product line roadmap view and improved usability based on feedback. The team plans to scale the app to the entire enterprise (enabling a company-wide view of portfolio plans) and to completely eliminate Excel usage for portfolio management. Customized, full-fledged portfolio management solution. Roadmap views from different perspectives for visualizing timelines. Pivot-table functionality, with ad-hoc reporting across various dimensions. Analysis and prioritization (scorecard) functions. Parameters for project classification and prioritization.